This week’s giveaway ends Thursday, Sept 18th at I don’t know o’clock. I’m sure it will be around 9p.m. MST, but I need to check with Dave first. Anyway, check out the details on how to win here. 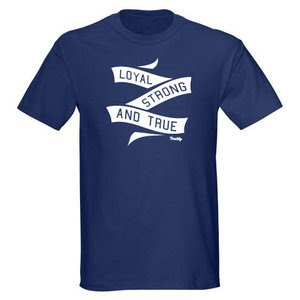 You can win the Loyal, Strong and True tee. Good luck and spread the word! how fun that you started a company! im excited for you guys! basically i do everything! hair coloring, cuts (adults and kids), extensions, perms, you name it! i also have another little spot where i do facials, all waxing, etc. its been fun!